Every day, innovations were made to make our life easier. In the field of medicine, these innovations were used to save more lives and cut the cost of medical treatment. In the field of dentistry, innovations have made the assessment and diagnosis of oral health problems a lot easier and the treatments less invasive, more comfortable and convenient. Intraoral camera is just one of the many dental innovations used in assessing and diagnosing oral health problems. It enables you and your dentist to have an intraoral close-up analysis of the different structures inside your mouth. An intraoral camera has a built-in light source which allows the dentist and the patient to see the external structures of the teeth, the gums and the buccal cavity. 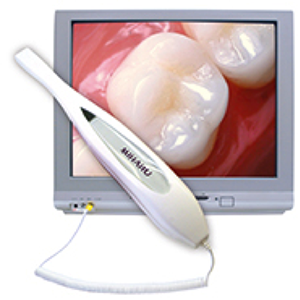 With the illumination, intraoral camera is used to take videos and the still camera is used to capture the image of the condition of the teeth which helps in the assessment and diagnosis of plaque formation, dental cavities, gum diseases, chipped or cracked tooth, broken dental fillings and other oral conditions. It is used in oral cancer screening. Patients, who are at high-risk for oral cancer such as those who are heavy alcohol drinkers and smokers, are screened for this disease. The camera is used to detect lesions or tumors that are indicative of oral cancer. Photos taken during this screening are sent to a cancer specialist for better assessment and diagnosis of the patient’s oral condition. The photos taken give an accurate description and measurement of the lesion or tumor inside the mouth rather than the traditional doctor’s or dentist’s notes which relies on how the doctor or dentist sees it. It is used in patient education. Most dental hygienists and dentists use intraoral cameras to educate their patient about his/her oral health. With the use of the camera, the patient is able to see the condition of his/her teeth and helps the dentist in discussing the disease condition of the teeth and how it could be prevented. It helps in convincing the patient to undergo dental treatments that would help restore and save teeth or gums from total destruction. The videos and photos taken by the camera will help the dentist in explaining the disease condition of the teeth or gums and how the proposed dental treatment will help manage the condition. This will help in calming anxious patients of the incoming dental procedure. The photos and videos taken by the intraoral camera will serve as a basis of the oral health condition of the patient. With the photos in file, the dentist will be able to assess whether dental treatments in the past have indeed made a positive progression in the dental health of the patient. The photos can also be sent to your insurance company if it is needed. If you are curious if your dental clinic offers dental imaging via intraoral cameras, you may want to ask them or your dentist about it.